Serving as a prequel to Twelve Kings in Sharakhai, the first book of The Song of Shattered Sands, Of Sand and Malice Made is a thoroughly entertaining story that adds another layer to the world that Bradley P. Beaulieu has created. Consisting of three interlinked tales, this is a book that goes beyond mere setting and culture to put a true Arabian Nights spin on epic fantasy. That fact surprised me almost as much as it delighted me, for it seems rather fitting that Çeda's first chapter should have such a familiar, classic sort of feel to it. These aren't quite fables or folk tales, but all of the elements are there, right from supernatural deities to charms and curses. Freed of the pacing issues and narrative flashbacks that were something of a challenge in Twelve Kings in Sharakhai, this is a story that all but races along as it gets the heart racing. What really excited me about it is that there is a feeling of genuine risk involved, which is hard to pull off in a prequel where you already know the fates of the main characters. In fact, there was several points where I had to glance back at my copy of the first book to confirm certain names (and fates). 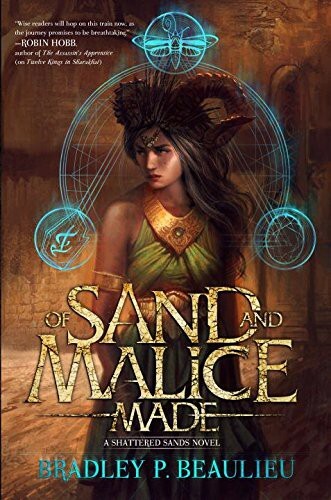 Of Sand and Malice Made is a perfect little book, entirely suitable as an introduction for new readers, yet completely rewarding for fans of the series. It has all of the humor, the wonder, and the excitement you'd expect of Beaulieu, with the addition of an entirely chilling new villain. Well worth the read. Fantastic, I can't wait to read this. I'm always a little wary about the short fiction/novella format, but your review makes it sound amazing.